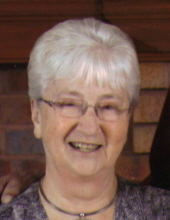 Mary Ann Haas, age 72, of Potosi, passed away on Thursday, February 7, 2019, at her home surrounded by her loving family. She was born on July 24, 1946, in Dubuque, IA, the daughter of Clarence A. and Rose Ella (Earle) Ehlen. Mary graduated from Potosi High School. On November 14, 1964, she was united in marriage to James "Jim" Haas at St. Thomas Catholic Church in Potosi. After their marriage, Mary was a homemaker and did some babysitting. She also cooked at SS Andrew Thomas School. Mary was later employed at the Platteville Journal in the bindery department where she met some of her life-long friends. She then worked for the UW Platteville, until she was diagnosed with cancer, twenty-one years ago. Mary enjoyed playing cards, reading, cooking, coloring, ceramics, crafts, and spending time with her grandchildren and attending all their activities. Survivors include her loving husband of 54 years, Jim Haas; their children: Joseph (Dawn) Haas; Beth (Kevin) Flesch; Thomas (Sonia) Haas; Amy (Tim) Bailie; 13 grandchildren: Cody, Derek (Emily), Ashley (Adam), Cole, Courtney, Nick, Brittany, Jamison, Michael, Matt, Marissa (Keith), Marie (Ryan), and Marcus; four great-grandchildren; her brothers: Clarence Ehlen; Joe (Joan) Ehlen; Ray (Sue) Ehlen; sister-in-law, Sarah (George "Bud") Pemsl; many nieces, nephews, and friends. In addition to her parents, Mary was preceded in death by a son, Michael in 1990; father and mother-in-law, Lawrence and Marie Haas; brother-in-law: Joseph (Sharlene) Haas; sisters-in-law: Pat (Bill) Brindley and Shirley Ehlen; one great-grandson, Devin. A Mass of Christian Burial will be held on Tuesday, February 12, 2019, at 11:00 a.m. at St. Andrew Catholic Church in Tennyson with Father Richard Leffler officiating. Burial will be in St. Andrew Cemetery, Tennyson. Family and friends may call on Monday, February 11, 2019, from 4:00 p.m. until 7:00 p.m. at Martin Schwartz Funeral Home & Crematory, 1234 S Madison, Lancaster. Friends may also call on Tuesday, February 12, 2019, from 10:00 a.m. until time of services at the church. In lieu of plants and flowers, a Mary A. Haas Memorial Fund has been established. To plant a tree in memory of Mary A. Haas, please visit our Tribute Store. "Email Address" would like to share the life celebration of Mary A. Haas. Click on the "link" to go to share a favorite memory or leave a condolence message for the family.